The pink flamingo is a very fun vodka cocktail that has a delicious fruity flavor. You might think of it as an enhanced screwdriver, and it's almost as easy to make! This is just one recipe for a pink flamingo. As you might imagine, it's a great name for any pink, semi-tropical cocktail, so you will find recipes that vary quite a bit different. Yet, this particular mix has long been a favorite. Its vodka and Cointreau base is accented with the sweet taste of sloe gin, then the whole thing is topped off with orange juice. Whether you enjoy it at brunch, happy hour, or whenever you simply want a quick, refreshing drink, it's a fabulous choice. In a highball glass filled with ice, pour the vodka, Cointreau, and sloe gin. 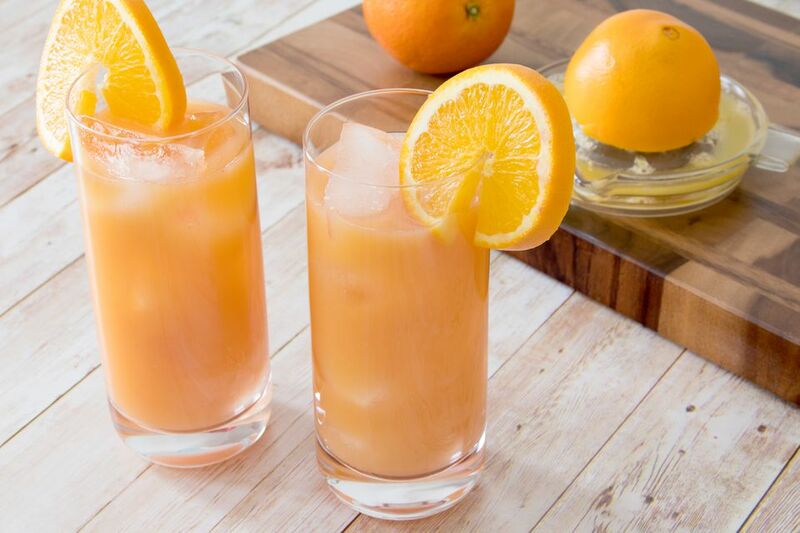 Pour as much orange juice as you like or need to fill the glass. The volume in the recipe is just a suggestion, though you may enjoy it with more or less. Since the fruit flavors of this cocktail are rather strong, there's really no need to pour the best vodka in your bar. Instead, this is a perfect drink to save a little cash by using one of the better-tasting cheap vodkas on the market. If you need a substitute for Cointreau, try triple sec or orange curaçao. Grand Marnier can be a nice option as well, though its brandy base will darken the drink's profile slightly. That's not necessarily a bad thing! The pink flamingo is a great recipe to transform into a big-batch cocktail. Simply keep the ingredient ratio the same to fill a pitcher or punch bowl. You can even make it ahead of time and store it in the refrigerator. UV Vodka created a martini-like pink flamingo that is very similar to this recipe in taste. The recipe features UV Lemonade (a pink, lemonade-flavored vodka) with cranberry juice and triple sec. Other versions of the pink flamingo include vanilla schnapps or grenadine instead of the orange liqueur and sloe gin, respectively. Another adds a little cream or cream of coconut for a rendition similar to the orange creamsicle. There's also a pink flamingo that splits the orange juice equally with lemonade. It tends to use grenadine or another red fruit-flavored simple syrup, like strawberry or raspberry, instead of sloe gin. You might even want to try substituting the vodka for either coconut or pineapple rum (or the vodka versions of the two flavors). To add a little sparkle, finish the drink off with a lemon-lime soda like Sprite. How Strong Is a Pink Flamingo? The amount of orange juice you actually end up pouring will affect the final alcohol content of your pink flamingo. And yet, this is generally going to be a relatively light mixed drink. When made according to the recipe, it weighs in around 19 percent ABV (38 proof), which is perfectly casual and only slightly stronger than a glass of wine.